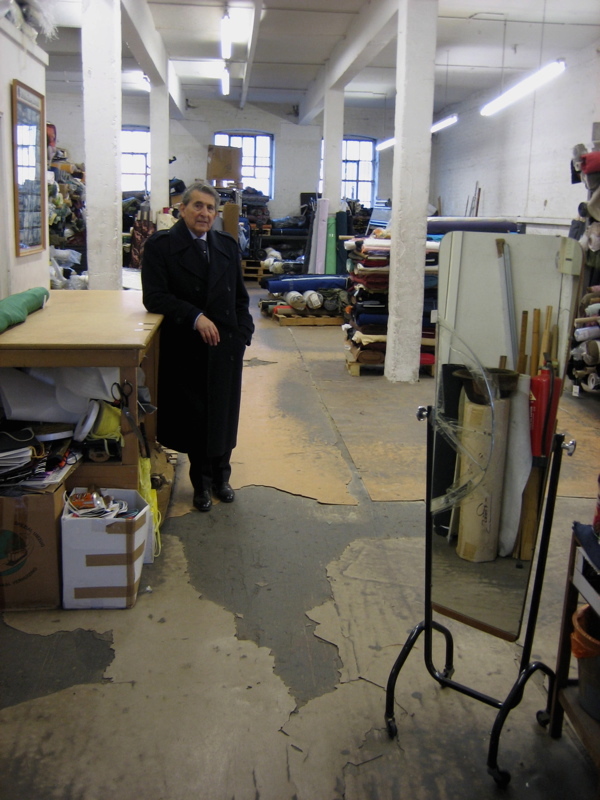 In the Spring, I visited Crescent Trading, the last cloth warehouse in Spitalfields, still operating in a way that Charles Dickens would recognise from his visit to a silk warehouse in 1851. 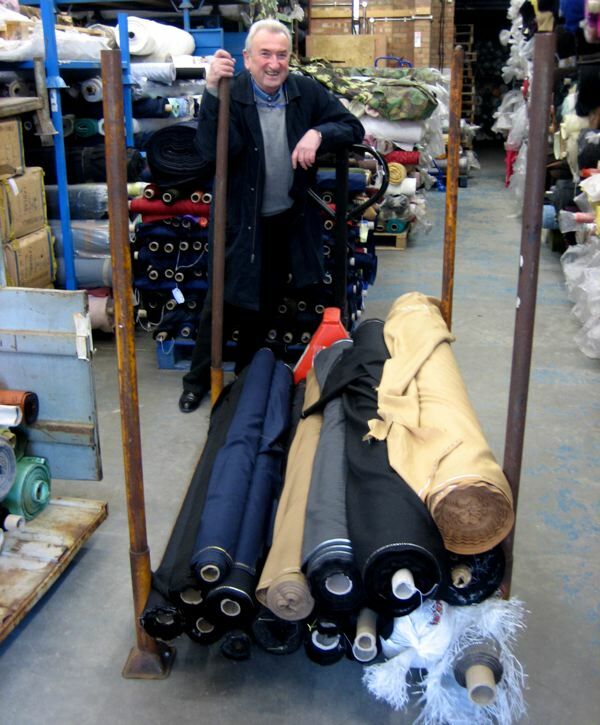 Distinguished proprietors Philip Pittack and Martin White are clearance cloth merchants of the old school who have spent their entire lives in the industry, with more than one hundred and twenty years experience between them. For the past twenty years they traded from a charismatic old stable block in Quaker St, but now that the landlord has acquired planning permission to convert the building into a hotel, they are moving to an industrial unit across the road. These are momentous days for Crescent Trading, so I took my camera along to record the move. I gasped to see the old warehouse, once packed to the rafters now cleared of cloth, and discovered Martin there, a dignified figure, ruminating like Hamlet in an empty theatre. 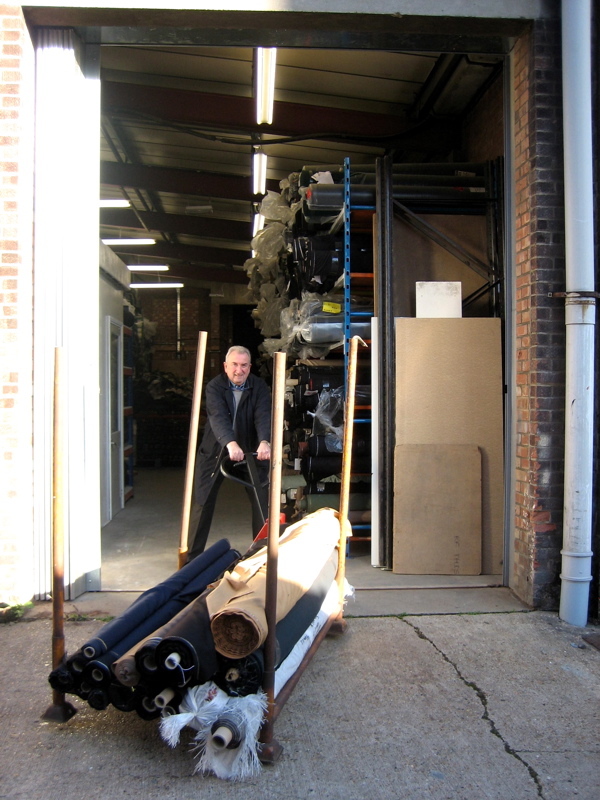 Meanwhile Philip hauled a trolley piled with of bolts of cloth across the street outside, pink in the face with exertion and yet full of cheery resolve to make it to the new premises, where they have taken out a five year lease. “He’s seventy-nine and I am sixty-seven,” confessed Philip as he ran up a ladder with a roll of fabric over his shoulder, demonstrating the careless abandon of a thirteen-year-old, “When the lease finishes he will be eighty-four and I will be seventy-two.” At just two thousand square feet, the new warehouse, constructed of breezeblocks with a metal shuttered door, is half the size of the old one, so Philip has invested in a racking system which means he can stack the cloth higher, but requires him to climb more ladders. Already customers are crossing the road, and they seem to like the new arrangement where everything can be seen at a glance. Crescent Trading is a treasure trove for small designers and design students who can buy cut lengths they could not get anywhere else, discovering rare high quality fabrics at a fraction of the cost they would pay at a mill. Even as Philip and I were talking, Mr Amecci, a designer in a snazzy deep blue serge trench coat with fur collar, fedora and forties moustache interposed. “Don’t write this up,” he begged me with winsome irony, “because I don’t want everyone to know! What I like about this place is that I can get things I wouldn’t get elsewhere, like mohair, mohair mixes and chinchilla at discount prices.” Then Matsuri, another cool-cat designer, entered in a Guy Fawkes hat with waist-length locks straggling out beneath, and eager for blazer-striped fabric. Regretfully, Philip had to send him back across the road to the old warehouse for it. Simultaneously excited by the custom and frustrated by the circumstance, “We’ve come to the point of no return where we are running back and forth across the road!” Philip admitted to me, rolling his eyes and waving his hands in self-dramatizing resignation. Yet within a month, the move will be complete and so I persuaded Philip to take me on a sentimental tour, visiting the first floor storage space that once had a lift shaft big enough to bring shire horses up to be stabled. We passed a huge reptilian conveyor belt for bringing rolls of cloth upstairs – broken ten years ago, it will never run again – and we entered the vast empty warehouse, breathtaking in its lyrical state of dereliction, and possessing a poetry that no industrial unit can ever match. These are emotional times at Crescent Trading. “I’m petrified,” admitted Philip when we were in private, revealing the nature of the passion that has driven him to manhandle every roll of cloth across the road, “We were happy. We had our feet under a table for twenty years. Now we eek out a living and times are very difficult. We have to work because all our money is sitting on the floor. This street used to be all small businesses, a trousermaker, three printers, a quilter and a dressmaker. I am angry that the council zoned this street as small businesses, and now it’s going to be just a hotel and a housing block.” And then, concerned that he might have lowered my spirits with this outburst, he put his hand into a box and slipped a bottle of whisky into my bag as I walked out the door. Let me reveal, my sympathies are with Philip Pittack and Martin White for many reasons, not just because of the whisky, or because they carry the history of the textile industry in Spitalfields with them, but most importantly because they are two of the most soulful and witty gentlemen you could ever hope to meet. They are my heroes, wielding scissors and tape measures. Legends in the rag trade, they know as much as anyone could ever know about cloth and they love meeting all the young fashion students that come seeking inspiration. 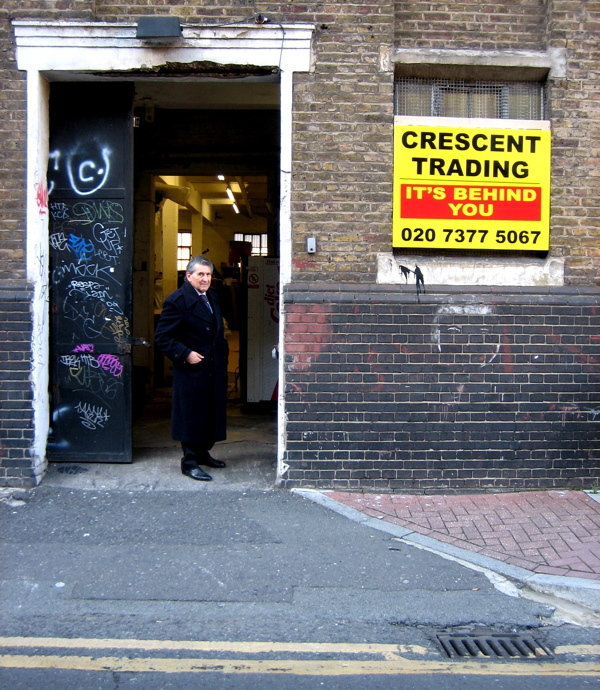 Whenever you visit Crescent Trading you will discover joy, because they sell it by the yard. Nobody is making a fortune, but everyone takes delight in celebrating all the varieties of fabric and the glorious multifarious human culture that attends it. Thanks to sheer willpower, canny ingenuity and a superhuman expense of physical energy on Philip Pittack’s part, Crescent Trading is still here. Everything has changed yet nothing has changed. 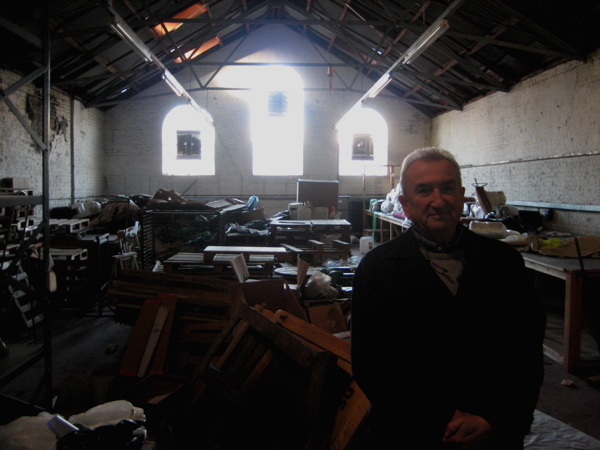 Philip Pittack takes a last look at the warehouse where he stored his cloth for twenty years. Philip sits upon the conveyor belt that broke ten years ago. 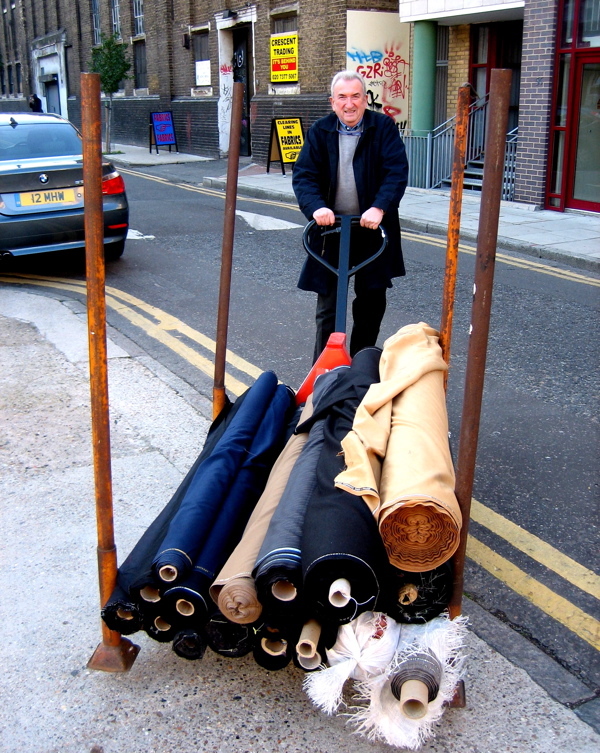 Philip personally manhandled every roll of fabric across Quaker St to the new warehouse. 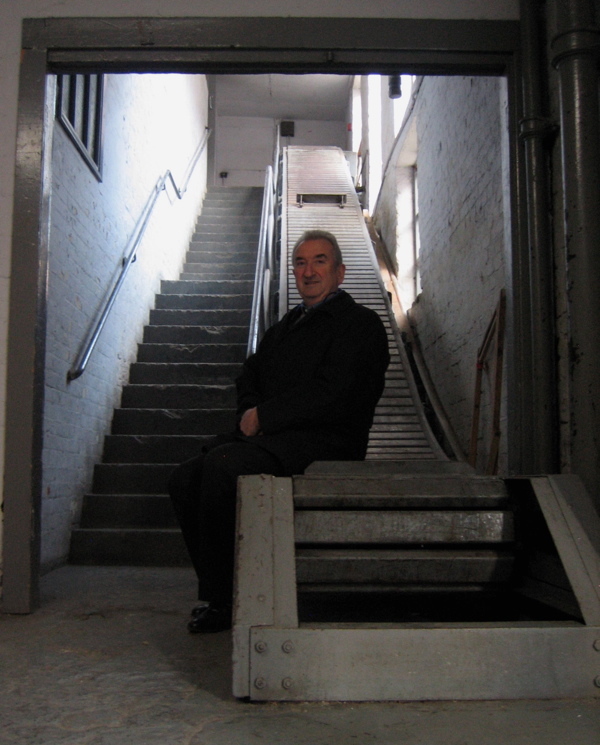 Martin White contemplates the old premises, soon to be a hotel. 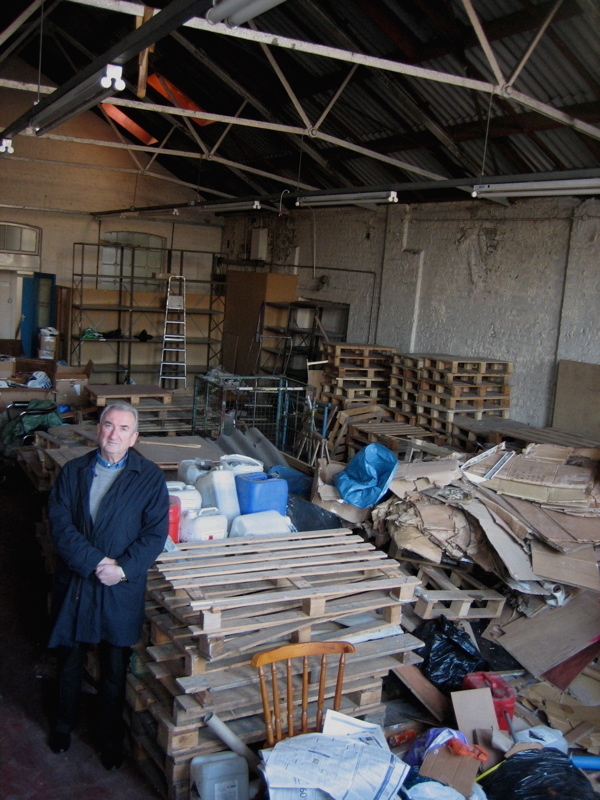 Philip arrives at the new warehouse on the other side of Quaker St.
Good Lord – a) to think of Philip manhandling all those heavy bales across by himself and b) to think of a hotel in Quaker Street…. amazing stories all round! I just want to say a big thank you to both Martin and Philip, who have served me, and made my business, the success, that it is today. I am certain that buying such great fabric, at such a decent prices, which in this day and age is very rare, you have enabled me stay in business whilst I see others collapsing, so thank you and I shall of course continue to see you at your new premises across the road. To think that that I have been buying from Crescent Trading for that many years is in itself amazing. You are an institution that we in the East End need to treasure. ok i want to buy some cloth from them, how do I go about it?